I suffered with quite extreme baby blues with both babies. I don’t think I had it long enough to call it PND. [Post-Natal Depression], but I was very low and very tired. Both times, I found the first few weeks a real shock, I was full of regret and very low. My second child had reflux though and once we got this managed, at about six weeks, she settled down and so did I. By three months I was over the moon with my babies. Losing your independence and personal space. I miss my children terribly, even when I'm away for just a couple of hours, so having time to myself is never the same as it was before children. I also miss just being able to 'pop out'. Being with them. I am blessed with two very good-natured children, but spending time with them is always a joy. That you won’t feel awful forever. You get your sleep back and you get into a rhythm/routine with your baby after a few weeks and then it becomes an overwhelming joy. Don’t worry that you will feel terrible/low forever, it only lasts a few weeks – pretty much all mums are shell-shocked with a new baby (first, second or third), so try not to stress about it. For my first child, my feeding chair. Even though I didn’t breastfeed for very long, I had it in the sitting room and it was therefore a relaxing and comfortable place to feed and cuddle. 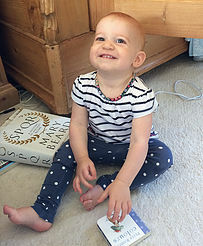 For my second, it was the baby monitor with the sensor pad that went under the mattress, so it was an extra reassurance that she was ok. And, most importantly, The Sensational Baby Sleep Plan by Alison Scott-Wright. Breastfeeding! I didn’t get on with it very well with either of them and it caused me no end of angst, tears and pain. I didn’t find this hard. There are a number of websites and books that detail what you need and I also had the advice of family and friends. There wasn’t anything that I didn’t have by the time I gave birth. Some sites list more things than you actually need. I was also told not to get a breast pump to start with, but I ended up getting one after just a few days. Walking is always great. Rain or shine. Musical toys and things that are noisy. It doesn’t have to cost money though, a pan and a wooden spoon work just as well. Books have always been a firm favourite with mine too. Touchy-feely books are great. I would use my Sleeping Plan book again and again and again. It saved my sanity and it gave my husband and I our time together back again. Alison also was an immense support for our second child's reflux, so I am so glad I had her book to be able to work out the signs. I don’t stress as much this time around (second baby). I leave her with more people, so she doesn’t get too clingy like my first did. I will also allow us days out rather than being chained to her nap times. On the odd occasion she doesn’t get her daily sleep, she bounces back! It isn’t a life or death situation! Not unless it was by accident! I don’t enjoy being pregnant and my baby blues were worse the second time around. My fear would be that they would get increasingly more difficult with each child. Try not to get too hung up on the labour. Yes, it is hard and painful, but actually having a child is more important. It becomes a bit insignificant afterwards. You remember it and talk about it, but the important thing is the amazing baby you have. Oh and keeping calm and relaxed in labour makes it an entirely different experience. I did hypno-birthing and it allowed me to have a truly beautiful birth with my second.